Superb "Padmaraga". 3rd party certified unheated, Ceylon, vivid, hot pink sapphire. What a beautiful & rich color. 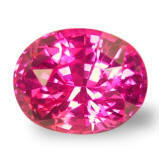 In antiquity, pink sapphires were considered feminine or less ripe rubies, Padmaragas. While darker red or purplish-reds were considered masculine stones. Here is a beautiful, unheated & natural gem up fro grasp. Re-polished the top, and lost 3 points from original, certified stone. It weighs now 1.51 cts., medium, vivid, neon hot pink color, perfectly executed, oval, mixed cut, measuring 7.14 x 5.63 x 4.50mm, eye flawless, VVS2 in clarity, from the Marapana gem area, cut and polished in Ratnapura, Sri Lanka. Gorgeous color. Certified by GIL-Canada as unheated. Unique & rare, bicolor, blue & yellow, Ceylon fancy sapphire. Just beautiful. A very unique, rare, and definitely exotic, unheated, Ceylon bicolor sapphire, weighing 1.06 cts., with blue color extremities and yellow central body, well executed, oval, mixed cut, and measuring , eye flawless, VVS2 in clarity, from the gem fields of Marapana, cut & polished in Ratnapura, Sri Lanka. Zoning is very common in sapphires, lighter and darker areas of the same color in the stone. And sometimes, you get 2 different colors in one stone. The most dramatic are the yellows-blues hues, and this combination is definitely rare. Beautiful & unique sapphire up fro grasp. Serene, diamond-like brilliant, unheated, Ceylon green sapphire. Real nice in real life. A very sparkling, unheated, Ceylon green sapphire, weighing 1.11 cts., pastel, mint green color, masterly executed, antique cushion, mixed cut, measuring 6.27 x 5.40 x 3.77mm, eye flawless, VVS1 in clarity, from the gem fields of Kalawana, cut and polished in Ratnapura, Sri Lanka. Unfortunately, the pic does not show the true beauty, character and diamond-like sparkle of this mint green sapphire. For a long time, we have been buying at origin, directly from ethical, professional and trustworthy miners. We then cut our cherry picked rough locally in Ratnapura with a couple of talented gem artists. A real nice green sapphire this one. 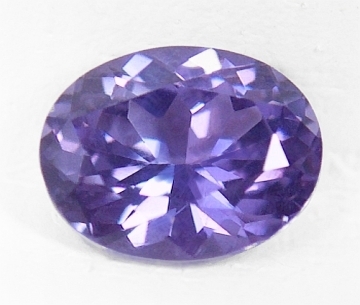 Sweet, unheated, Ceylon violet sapphire. Rare color. A very sweet, unheated, Ceylon violet sapphire, weighting 1.07 cts., medium, bluish violet color, perfectly executed, oval, "star" cut, and measuring 6.55 x 5.68 x 3.82mm, eye flawless, VVS2 in clarity, from the gem deposits of Nivitigala, Sri Lanka. A rare violet color, that does not display a color change, as most of violet colors do, (changing to a pink color in incandescent light). Completely natural, unheated and untreated, this sapphire will mount well in any setting chosen. And at this price, a great buy. Exotic, lovely shape, with flawless clarity, color change, Ceylon sapphire. Gorgeous. 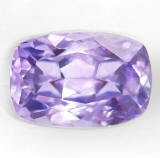 An exotic, unheated, Ceylon "fancy" sapphire, weighting 1.14 cts., medium "grape" cold violet color in daylight changing to purplish-violet with pink flashes in incandescent light, masterly executed, "antique' cushion, mixed cut, measuring 6.19x4.98x3.92mm, eye flawless, VVS1 from the gem fields of Nivitigala, Sri Lanka. 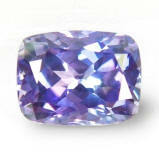 Unfortunately, unheated sapphires are becoming virtually not available and increasing in price. This is a very good time to buy. Ask for "special" prices if you buy more than one stone listed in these pages. The best value you can get anywhere. Period! Real nice, 3rd party certified unheated, Ceylon pink sapphire. Nice one. 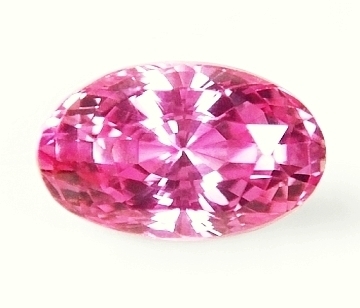 A truly magnificent, unheated, Ceylon pink sapphire weighting 2.215 cts., medium, intense, vivid, pink color with a very slightly orangish undertone, uniquely executed, slender, oval, mixed cut, measuring 9.17x5.81x5.04mm, eye flawless gem, VVS1 type2 from the gem fields of Marapana, Sri Lanka. A couple of decades ago, the gem fields of Sri Lanka, were producing definitely more unheated pink sapphire rough. Nowadays, fine color, unheated pinks are as scarce as fine Padparadschas and command huge prices. Well, if you want a superb, unheated pink sapphire in the most sought after 2+ cts. size, this is the one. 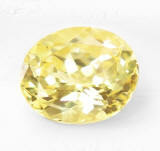 Certified by Emil Gem Lab (Japan) as "unheated". Exotically colored, well cut for large appearance, unheated, color change, Ceylon lavender-violet sapphire. 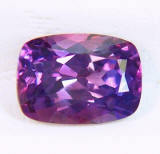 A real uniquely colored, unheated, Ceylon "fancy" sapphire weighting 1.66 cts., medium, vivid, lavender-violet color, changing to violet-pink under incandescent light, very well executed, rectangular, cushion, mixed cut, measuring 8.31x5.59x3.58mm, VS1 from the gem fields of Pelmadulla, Sri Lanka. Lovely elongated rectangular shape, a very rare color (with a color change too) displaying an undeniable exotic presence. Very good size too for a completely no heat` sapphire of unique presence. Will mount splendid in any setting and at a ridiculous low, wholesale price. 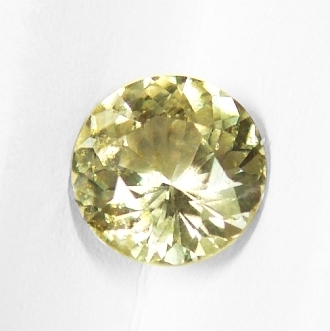 Lustrous & effulgent, very well cut, unheated, Ceylon yellow sapphire. A bargain. Purely brilliant, this unheated, Ceylon yellow sapphire weights 1.12 cts., very light, pure, "straw" yellow color, masterly executed, oval, mixed cut (with "flower" pavilion), and measuring 6.6x5.53x3.87mm, flawless gem, IF-VVS1 from the gem fields of Marapana, Sri Lanka. The color is somewhat a pale straw yellow, but possessing an adamantine luster with no extinction areas. Beautiful unheated sapphire if you love brilliance and a diamond-like feel. And what a great price too. Adorable & well cut, uniquely charming, unheated, Ceylon purplish-pink sapphire. Below wholesale. 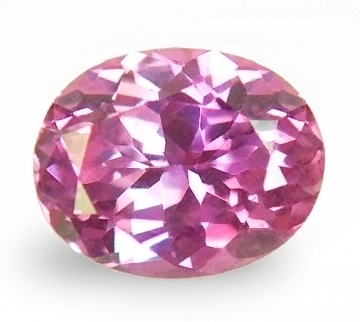 A very unique (with superb cutting) colored, unheated, Ceylon purplish-pink sapphire, weighting 1.13 cts., medium, "antique" pink color (purplish-pink with slightly platinum undertones), masterly executed, oval, "flower" cut, measuring 6.9x5.7x3.61mm, eye flawless, IF-VVS1 from the gem fields of Kuruvita, Sri Lanka. Adorable sapphire with gentle eye appeal, yes scintillating and vivacious nature. Rather unique shade of pink color...of course totally unheated/untreated as mother nature created it millions of years ago (cut applied). 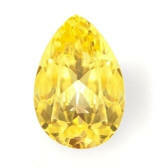 Like a sun's drop, excellent color, amiable, unheated, Ceylon yellow sapphire. A bargain. Lovely unheated, Ceylon yellow sapphire this one, weighting 0.92 cts., medium, intense, "lemon" yellow color, masterly executed, drop shape, mixed cut, and measuring 7.6x5.13x2.95mm, flawless gem, IF-VVs1 from the gem fields of Elahera, Sri Lanka. A beautiful drop shape, natural in color, 100% unheated (like this is something new...) at a great price. We are the source for lovely, completely natural, without any treatments, "fancy" sapphires at wholesale prices. Do not be a fool and purchase at inflated prices. Sensuously unique, perfect "antique" cushion cut, unheated, color change, Ceylon bluish-purple sapphire. What about a bi-color? This unheated, Ceylon "fancy" sapphire weights 1.48 cts., medium-dark, pinkish-purple with a blue area (bi-color) in daylight, changing to rich purple with pink flashes in incandescent light, masterly executed, "antique" cushion, "flower" cut, and measuring 7.27x5.26x4.16mm, eye flawless, VVS1 from the gem fields of Elahera, Sri Lanka. Very often, finding 2 or 3 colors in the same, rough water worn pebble is just the norm. However not all bi-colors or tri-colors are created equals. A perfect & well proportioned cut will ensure that perfect blend of colors and exciting look in a lovely multi-color, exotic sapphire. And this is unheated too...at a great price. 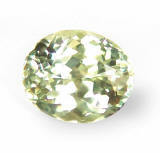 Exotic & very sparkling, unheated, "greenish-bronze" Umba sapphire. Beautiful! A very delightful, unheated "fancy" sapphire weighting 1.27 cts., medium, greenish-bronze" color, perfectly executed, round, mixed cut (with "flower" or "Portuguese" pavilion), measuring 6.55mm in diameter by 3.95mm, completely eye clean, VS to SI clarity, type2 from the alluvial gravel of the Umba river, Northern Tanzania. Excellent cutting, this uniquely colored sapphire has excellent (large) dimensions for its carat weight. The greenish-bronze color is so unique that it is a must for all the lovers of unheated sapphires. It will mount exotic, or just add it to your collection...at this price, surely a great deal for an undeniable charmer! 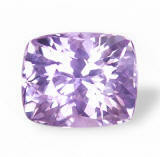 Adorably charming, masterly cut & flawless, unheated, Ceylon violet spinel. What a great buy! 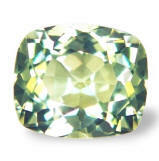 Joyful, dancing with light, rare nowadays, unheated, Montana light green sapphire. Finely cut. A very brilliant, rare in today;' market, completely no heat (no treatments) Montana sapphire, weighting 1.26 cts., pastel, "mint" green color, very slightly yellowish in undertone, masterly executed, oval "flower" cut, and measuring 6.82x5.69x3.91mm, eye flawless, VVS1 from the Rock Creek bars, Missouri river, Montana. This all American sapphire is bless with immaculate clarity and a cool, diamond-like effulgence due to an outstanding cut. Very sparkling indeed. And completely natural, as mother nature created it millions of years ago (cut & polish applied). Great price too. 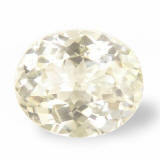 Sensuous & scintillating, very well cut & clean, unheated, Ceylon, faint yellow sapphire. Rare hue. Such a beautiful, lustrous, unheated sapphire this one. It weights 1.85 cts., very light, faint yellow (or yellow tinted white if you prefer), perfectly executed, oval "flower" cut, and measuring 7.79 x 6.50 x 4.30mm, eye flawless, VVS1 from the gem fields of Kuruvita, cut & polished in Ratnapura, Sri Lanka. An hybrid color in between a white and a yellow. 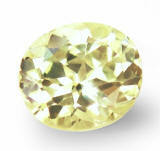 Super sparkling oval with ideal cutting proportions, as clean as it gets, and very affordable. It will mount simply fabulous. Why pay 4-5 times more for the same quality?. Unless your money grows on your backyard trees, no reason at all. Be savvy, be smart. Delightful, very well cut, unheated, Ceylon, color change pinkish-violet sapphire. Rare. Simply an amiable, unheated, Ceylon "fancy" sapphire displaying a perfect cut. It weights 0.98 cts., pastel, pinkish-violet sapphire in daylight, changing to a steely pink in incandescent light, perfectly executed, "antique" cushion, "flower" cut, measuring 5.90 x 4.83 x 3.81mm, eye flawless, VVS1 from the gem fields of Balangoda, Sri Lanka. 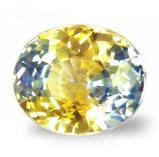 We are the source for unheated, Ceylon fancy sapphires of superior cutting, clean clarity and natural, untampered colors. Start your collection today or have one or more set in one-of-a-kind jewels. These are destined to appreciate as time goes by. And remember, the more you buy, the more you save. Amiable & sparkling, well cut & clean, unheated, Ceylon "fancy" sapphire. Beautiful. A very crisp & amiably clean, unheated, Ceylon "fancy" sapphire, weighting 0.71 cts., pastel, bright, yellowish-greenish color, masterly executed, oval, "star" cut, 5.6x4.78x3.29mm, flawless clarity, IF-VVS1 from the gem fields of Marapana, Sri Lanka. Such a bright and crisp sapphire, with a soft, pastel greenish color. The cut is perfect as well, and the clarity as usual at its best. 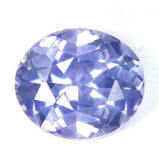 Overall, a beautiful Ceylon "fancy" sapphire that must be added to any serious colored stone collection. Did we mention it is unheated?... (like it is a new statement around here...). Adorable & effulgent, very well cut, unheated, Ceylon yellow sapphire. Lively. 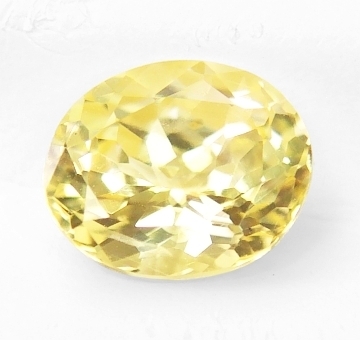 A beautiful, no heat, Ceylon yellow sapphire up for grasp. 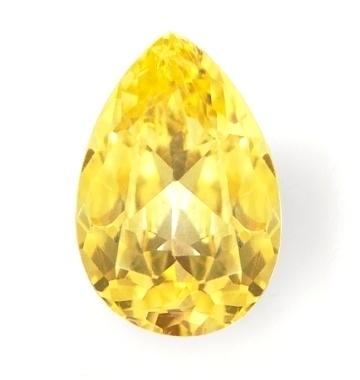 It weights 1.16 cts, medium, "lemon" yellow color, perfectly executed, oval, "flower" cut, measuring 7x5.78x3.68mm, eye flawless, VVS2 from the gem fields of Nivitigala, Sri Lanka. Exuding joyfulness, this unheated yellow is ideally cut. Great face with perfect scintillation, and exciting luster, it is offered at a very low price. Right now prices for Ceylon unheated yellows are very high and not destined to go lower either. A shimmering yellow at a very low price.